“That’s the hottest track temp I’ve ever seen, and I’ve been doing this a long time,” said Rockingham Dragway owner Steve Earwood. Measurements showed the concrete positively glowing at up to 167 degrees. Still, the 16th Annual Schnitz Summer Sizzler—fourth round of the 2012 Mickey Thompson Performance Tires MIRock Superbike Series—went off without a hitch during the weekend heatwave of June 30-July1. Two time defending Orient Express Pro Street champion Rodney Williford’s strategy each year is to develop a hot weather tune-up that keeps him winning while others are spinning. 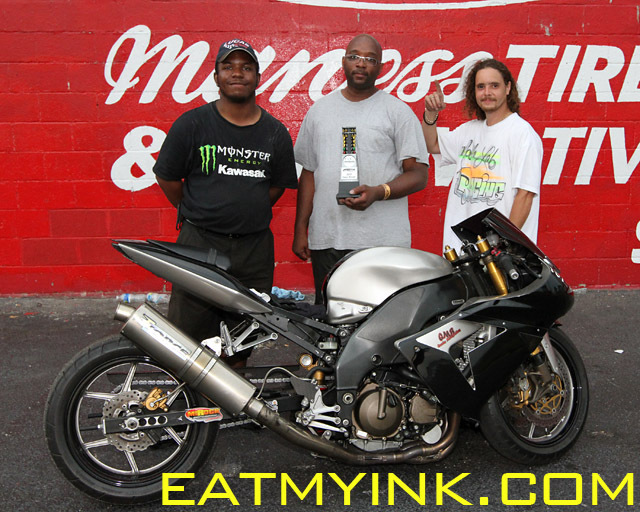 But this year Williford started off hot in the cool of spring, joining the exclusive 6 second club with his newly stretched out, turbocharged, Suzuki Hayabusa. As the weather warmed, Williford was lost—struggling to get off the line, overpowering the street tire, then launching the bike into wild wheelies down track. Even in Saturday qualifying at The Rock, Williford could muster no better than eighth, nearly 3/10ths behind number 1 qualifier Greg Wallace’s 7.36 at 200 mph on one of the DME Racing ‘Busas. The weekend’s excessive heat started rearing its ugly head with a slew of round 1 no-shows in all classes on raceday, giving Wallace, teammate Joey Gladstone, and Carl “Junebug” Lucas all byes. Lucas lost to Eric Hart in round 2, Gladstone beat Wallace for the bye to the final, and Williford beat Danny Cox before taking out Hart to meet Gladstone for all the marbles. 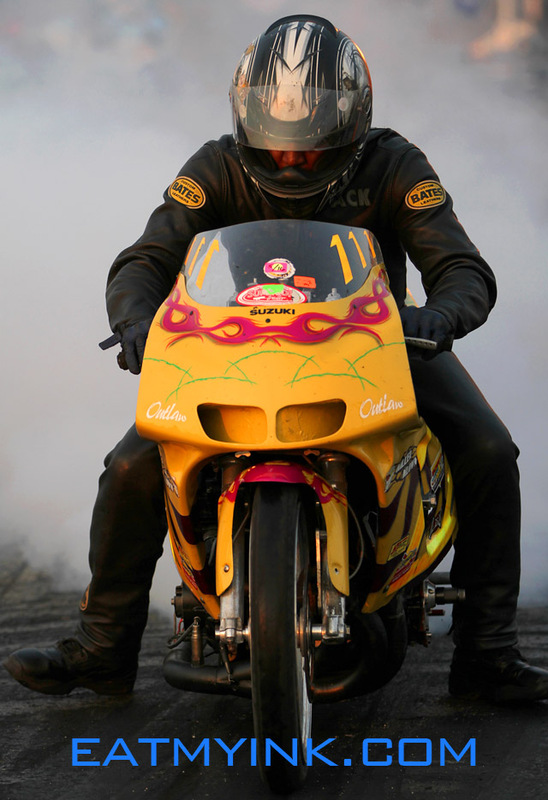 But Joey’s bike wouldn’t fire for the final and Williford had the track to himself for his first win of the year. Robbie Hunnicutt stung fellow (former?) Legion of Doom racer Ronnie Procoppio with a win in Mickey Thompson Pro Mod eighth mile class. Number 1 qualifier Mac McAdams (4.24) lost to Hunnicutt in the semifinals, and Procopio beat Ryan Schnitz and the HTP Performance Hayabusa in the other semi. Hunnicutt caught Procoppio absolutely sleeping (.070 to .142) in the final and held the advantage all the way to the finishline for the win. 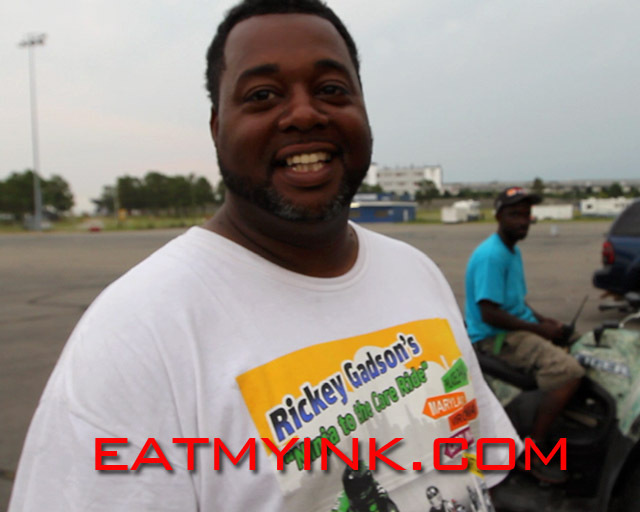 “Let me start by saying thanks to the whole crew at Rockingham Dragway!” said Hunnicutt. “They had the track in great shape for the weather conditions. We had to deal with the worst weather I have had to race in, and I’ve been racing since 1986, so that’s a pretty long time. “When we got there Saturday, I was really dreading having to put on my all black Superman leathers, so I went old school with my white and black suit that I use to wear in my Prostar days. It was a good thing too, because they need to be cleaned, if possible—they were soaked! I had salt on the outside of them from me sweating through them. And I might have to have them cleaned soon, ’cause I might have to bring them back out for the next race. I have lost twice in the finals to Ronnie wearing the black suit. Who knows maybe ‘Superman Returns’ in the blue suit at MIR?” Now that’s funny, because Earwood was saying on Monday that the old leathers would become Robbie’s lucky leathers and we both said he probably won’t be able to race without them now! “I was hoping to have to run Ronnie in the first round but as luck would have it for him, Richard Gadson’s qualifing run on Friday got thrown out, and I ended up having to run Rich first round instead. I told my crewman Tee Parker ‘They gonna make me do it the hard way.’ I was really looking forward to knocking Ronnie and (his tuner) Dan Wagner off early, but ended up having to wait till the finals to do it. Im just glad that Dan got to witness it first hand! With him tuning Ronnie’s bike this win makes it all that more special. Team LOD beat DTM and we couldnt be happier! “This year the ‘new’ Legion of Doom team is having some good results. I think it’s due to working as a team. We all work together to help each other even if we have to run each other. We got rid of the problems from the past and its starting to show. Oh, and to clear some misconceptions up, there are no other chapters!” Robbie is referring to an interview with Procopio at MIR that you can read here. “I want to say thanks to all my sponsors—Tull Plumbing, World Wide Bearings, Diamond Pistons, Schnitz Racing, Fast by Gast, Denso Iridium, Vanson Leathers and Hunnicutt Glass,” finished Robbie. DME Real Street bikes always handle challenging conditions better than the other pro classes, and this race was no exception. Ready to end the thrashing being dished out this season by Exoticycles‘ Johnny “Turbo” Dobrin, two time defending champion Jeremy Teasley qualified number 1 with a 7.84 on his Roger Starrette-tuned, nitrous Kawasaki ZX14. The two met in the final, and when Dobrin pushed the tree to erase Teasley’s performance advantage, he pushed too hard and redlit. “I’m hot, I’m tired, I’m old, and I was thinking about my boat,” said Dobrin. Fun For All Motorsports racer Ron Arnold made the long trip from Kentucky pay off with a House of Speed Crazy 8s win. 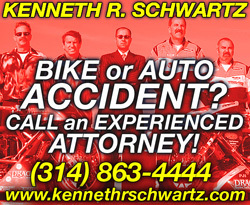 Arnold beat champion Andy Baumbach when both bikes spun at the hit and broke out at the big end. 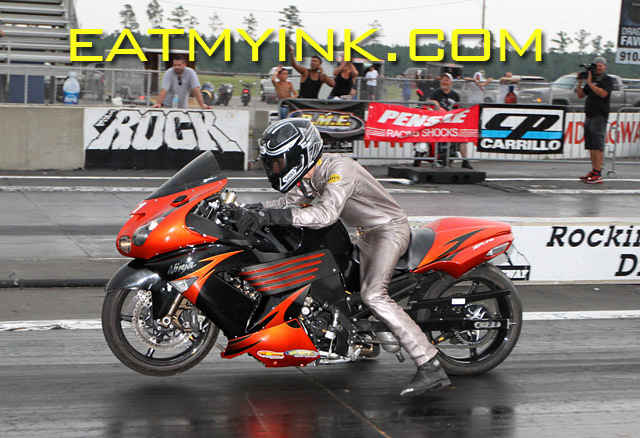 Durham’s Jack Durant won FBR Shop 5.60 on his Outlaw Pro Street style bike with a better light vs. Jimmy Shifflett, who broke out chasing Durant down. Shifflett’s trailermate Michael Rankin won Trac King/APE Top Sportsman when he put 5/100ths on MIRock veteran Boo Brown at the tree. Brock’s Performance Street ET wins went to Shayne Proctor on Saturday and Barry Purnell on Sunday. 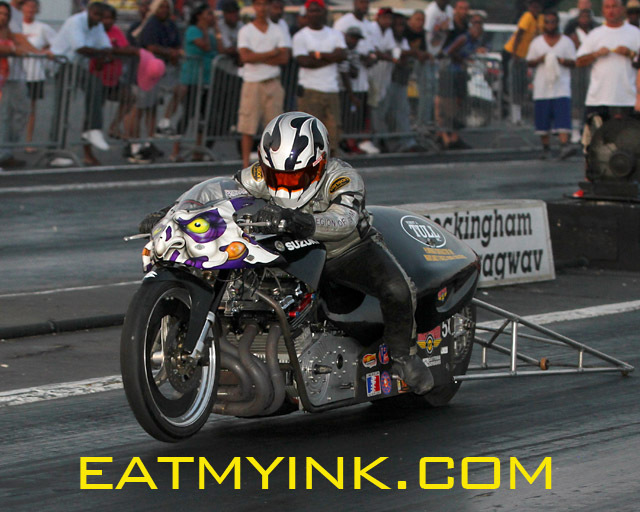 Barry Pryer Sr. won Nitrous Express Pro ET on Saturday, and Maryland’s Wardell Pinkney won on Sunday. Saturday night’s Afterdark Underground saw three hours of grudge racing before an enthusiastic crowd that was anxious to get out after being cooped up in the air conditioning all day. 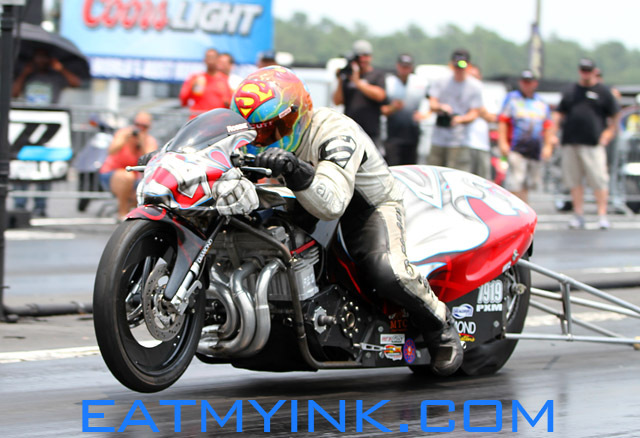 The Mickey Thompson Performance Tires MIRock Superbike Series returns to action July 21-22 with the huge and popular Fast by Gast/WPGC Bike Fest at Maryland International Raceway. 164 degree track temp has The Rock VOLCANIC! “That’s the hottest track temp I’ve ever seen, and I’ve been doing this a long time,” said Rockingham Dragway operator Steve Earwood. Measurements showed the concrete postively glowing at upwards of 160 degrees. Still, bikes have been going down the track, with DME’s Greg Wallace figuring how to do it best in Orient Express Pro Street with a 7.36 at 200. “Greg won’t stay number 1 for long,” vowed Neal Riddle, who’s third with a 7.42 behind Ryan Schnitz and the HTP nitrous Hayabusa’s 7.37. Carl “Junebug” Lucas carried Ricky Wood’s new paint job down the track to a 7.51. 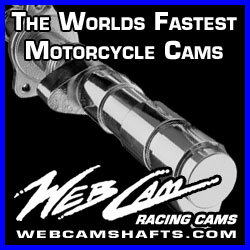 After breaking a cam yesterday on Kenny Edwards “No-Joke” ‘Busa, Jeremy Teasley is only qualified 6th with a 7.54. Champion Rodney Williford is just behind Teasley with a 7.64, and winner of the last two races Joey Gladstone is all the way back to 8th with a 7.67. Ryan Schnitz LEADS Mickey Thompson Pro Mod qualifying with a 4.298, followed by Ronnie Procoppio .001 behind and Robbie Hunnicutt another .001 back. “I don’t know how I can get down the track any better than that with it that hot,” said Hunnicutt, who reported a corrected altitude of 4200 feet despite low humidity. MIR April race winner Mac McAdams is only .002 behind Hunnicutt and Richard Gadson is only .007 behind Mac in what must surely be the closest tightest top 5 of Prp Mod qualifying ever—so far. DME Real Street bikes always handle challenging conditions better than the other pro classes, and today is no exception so far. 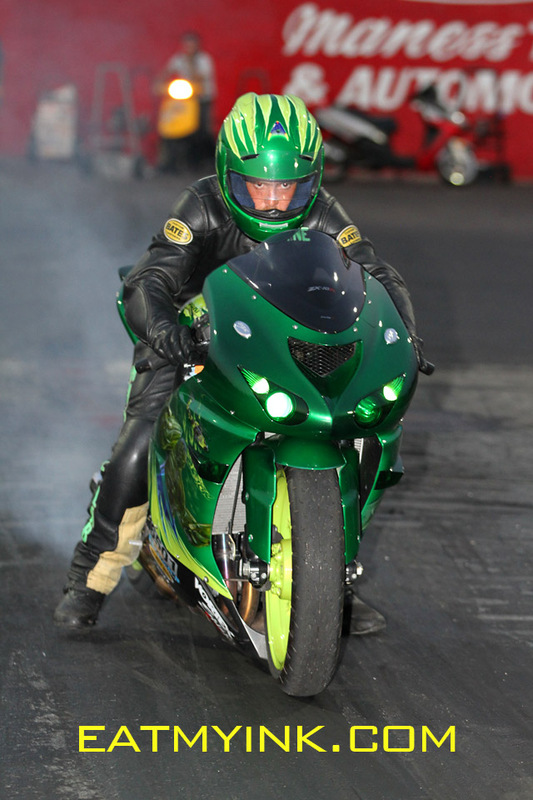 Ready to end the thrashing being dished out by Johnny “Turbo” Dobrin, champion Jeremy Teasley sits number 1 with a 7.84 on the Roger Starrette tuned nitrous Kawasaki ZX14. Dobrin is second with a 7.91, Richard Gadson third with a 7.96 and Cameron Teasley fourth. Expect the Sand Hills to come alive tonight and fill the lanes with Hottest Grudge Bikes on the planet, along with more pro qualifying and bracket eliminations! Eatmyink will be smoking, shooting and posting hard tonight, so look for it all right here right here. 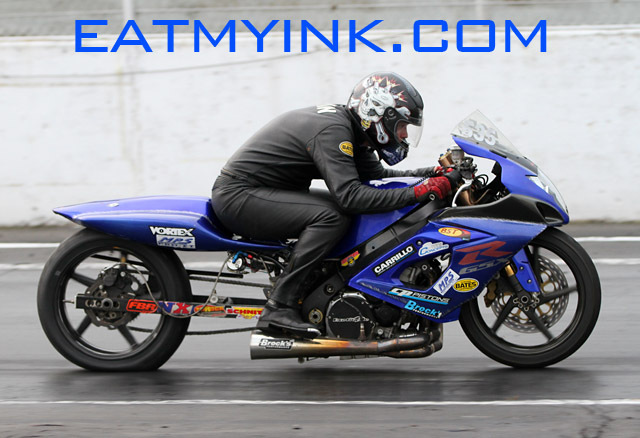 Rocked back on his heels, the once overpowering Jeremy Teasley is looking for a get-well weekend in more ways than one when the Mickey Thompson Performance Tires MiRock Superbike Series returns to Steve Earwood’s Rockingham Dragway on June 30-July 1 for the Schnitz Summer Sizzler. Teasley, the most prolific winner in the history of the series, has been shut out this year in three races in the DME Real Street class over which he has reigned with virtual impunity the last two seasons. His only wins of the season, in fact, came at The Rock where he won both Orient Express Pro Street and FBR Shop 5.60 Index at the Spring Open. More dramatically, Teasley still is aching from multiple injuries after the carbon fiber rear wheel on the Ken Edwards-owned “No Joke” Suzuki he was riding at Maryland International Raceway broke at 160 mph. Nevertheless, the young pro from Ohio still qualified and raced both Pro Street and Real Street, bandaged beneath his Bates Leathers. But the new 800-pound gorilla of Real Street seems to be Floridian Johnny “Turbo” Dobrin. While Teasley has won eight of the last nine Real Street races at Rockingham, Dobrin has won five of the last six races in the series including all three this season. Obviously, something has to give when the two hook up again in the Sizzler. Can anybody keep Ronnie Procopio from winning another Pro Mod championship? In addition to Real Street, Pro Street and 5.60 Index, the Schnitz Summer Sizzler will crown winners in Mickey Thompson Pro Mod, Trac King/APE Top Sportsman, House of Speed Crazy 8s, Nitrous Express Pro ET and Brock’s Performance Street ET. 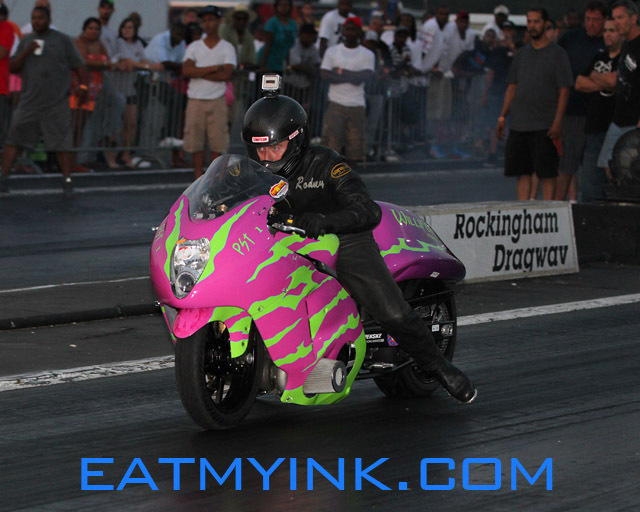 Reigning Pro Mod champion Ronnie Procopio Jr. of Wake Forest is solidly on top of the standings in that class again this year, but Joey Gladstone has found his niche on the DME racing Pro Street Hayabusa. Delaware’s Gladstone won the first two races at MIR, beating reigning champ Rodney Williford of Rougemont in one final and the world’s fastest Pro Street racer, Hoosier Ryan Schnitz, in the other. 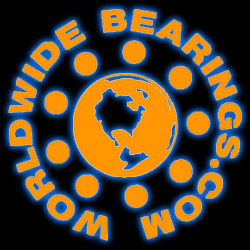 …or can Ryan Schnitz and HTP Performance get their mojo back? And what about “No Joke”? Back in action at The Rock? 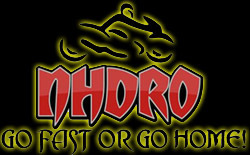 In addition to the fourth of eight rounds of MIRock Series competition, the event also will feature a full grudge racing program including the popular “Afterdark Underground” event following qualifying on Saturday night. Oh yeah, Grudge Racing at The Rock! ALL PHOTOS from The Rock! Although racing won’t officially begin until Saturday, the track will be open for private MIRock testing from 10 a.m. until 6 p.m. on Friday, preceding a regular weekly test-and-tune session from 6-11 p.m. Highlight of Saturday’s program will be pro qualifying at 1 p.m., 4 p.m. and 7 p.m. along with day-long qualifying in the sportsman categories. Gates open Sunday at 8 a.m. with single elimination finals beginning at 12 noon. Adult admission is $10 Friday, $20 Saturday and $20 Sunday. Special combo tickets also are available – $35 for Saturday and Sunday or $45 for all three days. Kids six to 11 are $5 daily. Those under six are free when accompanied by a ticketed adult.